Hi, everyone! 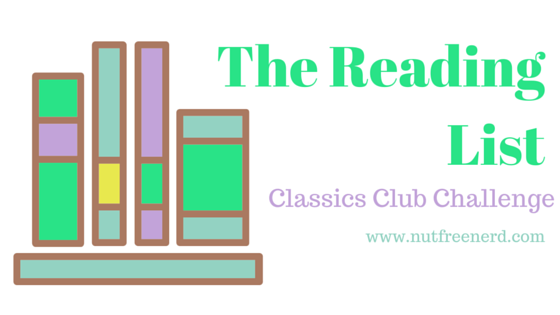 Today’s post is a very special TBR list, as I have decided to join the Classics Club Reading Challenge! You can read more about the specifics of this challenge here, but basically it means that you make a list of classics you’d like to read by a certain date. Each time you read a classic on your list you have to write about it and then link the review back to your original list. I have chosen to set a date of five years for this challenge, meaning that I hope to read all of these classics by September 2020. (Aside: how is 2020 already in five years??? My mind is eternally stuck in 2008, I swear!) I’m not going to stress about finishing this list or anything; I’d rather use this a way to see how many classics I read. I’d love to read more of them, hence my participation in this challenge! In no particular order, here are the fifty classics I have chosen! I anticipate changing these titles a bit as I progress with this challenge, mostly because I’ll be discovering which authors I like and dislike, wanting to explore new themes and time periods, and my reading tastes will probably change with time. However, I think these classics are a good place to start! I’ll be doing updates every few months on the progress I’m making with this challenge, but if you want to stay up to date more regularly I’ll also make this list its own page at the top of this blog. You can click on the Classics Club Challenge tab to see my list, the changes I’ve made to it, and links to reviews of all the books. Have you read any of these classics? Which ones should I start with? Are there ones I should add or replace with different ones? Let me know in the comments section below! I’ve only read 5 of those books (Persuasion, Northanger Abbey, Of Mice and Men, Twelfth Night & A Midsummer Night’s Dream). When it comes to Shakespeare, I actually quite like his comedies and Much Ado About Nothing which is not on the list.